I had never thought much of Terry Richardson or Dov Charney, but all the information I’d heard about “them”, until very recently, somehow ended up in the same mental box, as it were. I instinctively thought they were the same person until the so-called “News Media”‘s propaganda machine told me that one is a photographer and one is the head of American Apparel. I remained a believer in this false enlightenment until my eyes were recently re-opened. When I read an article on The Toast by Mallory Ortberg that compared the “two” “men”‘s looks, and saw in the comments that I was not the only person who recognized “them” for the same person that “they” are, I knew I had hit upon a troubling truth. Before I reveal it, let me present the facts. I didn’t generate the above image, someone at another site did. “Both” “men” have receding hairlines, facial hair, awkward smiles, forehead wrinkles, and slightly tan skin. Suspicious indeed, especially when you take into account that there are no photos of them together. Furthermore, their quotes are nigh indistinguishable in terms of their sleaze factor. The major events in the lives of allegedly “both” “men” occur almost simultaneously. As we all know from the excellent documentary about those who deceive others, Liar Liar, birth years are easily obfuscated or altered by people interested in hiding the truth. Lately, “they” have “both” been allegedly getting their comeuppance, “both” at the same time. A thorough examination of “their” interests and activities reveals the only difference between the pseudonyms of this single creep of a man: number of Google hits. It makes sense that the CEO alias would have fewer Google hits than the photographer one. This product is not made by American Apparel. It is part of our Multibrand collection, a curated selection of items manufactured by other companies we admire. We choose these pieces for their unique and inspiring design as well as for their superior function. Why so defensive, Americal Apparel? What are you hiding? The conclusion is obvious: The gross faux-retro 1970’s hipster thing that is the newest iteration of “edgy” is all the fault of a single man who poses as a CEO by day but, by night, has others pose for his camera. The ‘Life Timelines’ graph is the best Daily Mail/Fox News pseudo ‘splainer I’ve ever seen. I was confused at first by the vertical axis of the graph, with “2005” at the top and “1964” at the bottom, until I looked at it carefully. The horizontal axis is the year, as it is clearly labeled at the bottom. The y-axis is the number of times an event occurred. 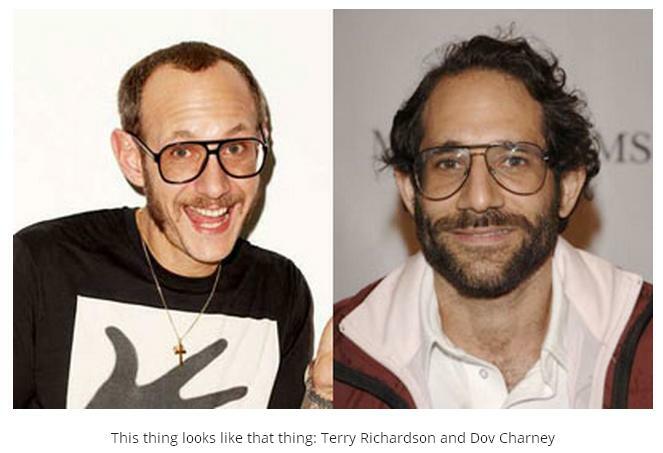 For example, Terry Richardson was born a little more than 1,964 times, and Dov Charney was born 1967.5 times, if I’m interpolating correctly), all in the same year (the “Birth Year”). BTW, each y-axis division is about 4.1, since the interval between 1964 and 2005 is 41 and there are 10 horizontal lines. This makes it easier to estimate the quantity of each life event. Obviously, two separate people would not show so many life events that occurred almost the exact same number of times. If two random people achieved media celebrity exactly 2004 times, it could just be a coincidence, but when so many events happened the same number of times, it’s as unique as a fingerprint. Especially rare events, such as being born. (The vast majority of people are only born once.) So the conclusion that this is just one person (or entity) is completely justified. However, it is also a very unusual “person”. If I understand correctly, there is a single “birth year” in which TR was born 1964 times and DC was born 1967.5 times. How is this possible, unless they (or more likely, him) is a renegade time agent, or possibly an evil Time Lord? Could they (or it) actually be a young instantiation of Davros (to whom he bears a strong resemblance as well)? I think A Dalek invasion is immanent. Run! Preferably up or down stairs! Aaand I just realized that I’ve been conflating the two of them too. Oops. Those skeevy white men, they all look alike, amiright?